The Cytology of Effusions: Pleural, Pericardial and Peritoneal and of Cerebrospinal Fluid, Second Edition provides information pertinent to the cytology of effusion in various conditions. 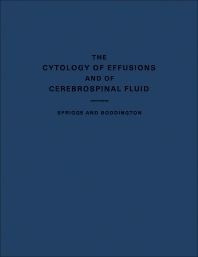 This book discusses the cytology of cerebrospinal fluid wherein the appropriate methods for studying this material are much the same as for serous fluids. Organized into nine chapters, this edition begins with an overview of the differential cell count from a serous fluid. This text then presents the nomenclature and descriptions of cells of serous effusions. Other chapters consider the cytological examinations of pleural or peritoneal fluid, which often shed light on the diagnosis in leukemias and lymphomas. This book discusses as well the general features of malignant effusions that may suggest the diagnosis. The final chapter deals with the distinction between polymorphonuclear and lymphocytic types of meningeal exudate made from an examination of the cerebrospinal fluid. This book is a valuable resource for pathologists and clinicians.